Who doesn't love a good chili spaghetti recipe? My littlest daughter, who will eat virtually anything, hates chili. She likes every ingredient in chili--and eats similar spices in tacos and burritos--but, HATED my chili. It didn't matter if I spiced it up--or took the spices down a level--chili was just not her thing. Then she discovered chili spaghetti and it was a whole different story. Apparently, anything IS better with pasta and cheese--especially for kids. I have an arsenal of chili recipes--and I never seem to make chili the same way twice. 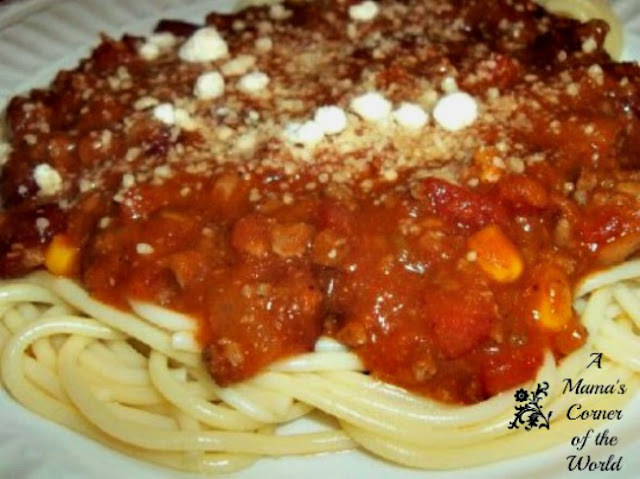 This chili spaghetti recipe is one that the kids will eat every time--and is one that the grown ups can easily spice up a bit. Brown meat and saute onion. In a non-stick, dutch oven, crumble the meat and brown over medium heat until meat is no longer pink. Add onion and saute until onion is translucent, 3-5 minutes. Drain excess fat from meat/onion mixture. Add spices. Add the black pepper, garlic powder, chilli powder, and cumin to the meat/onion mixture, stirring to coat. Add Additional Chili Ingredients. Add in the beans, the tomatoes, the salsa, the water, and the sugar--stirring to combine after each addition. Simmer to Blend Flavors. Bring the chili to a boil, reduce heat, cover and allow to simmer 30-45 minutes. Be sure to stir frequently as the refried beans cause the chili mixture to become thickened and stick to the bottom of the pan. Plate and Serve. Place a serving of cooked, thin spaghetti onto a dinner plate or a soup bowl. (I find our little do much better with spaghetti in a bowl than a plate!) Top with ladels of thickened chili and grated Parmesan cheese. We like to serve with cornbread or garlic bread and green salad--and we often add jalapeno peppers to the grown up serving plates when desired. Who doesn't love a good chili spaghetti recipe? My littlest daughter, who will eat virtually anything, hates chili. She likes every ingredient in chili--and eats similar spices in tacos and burritos--but, HATED my chili. It didn't matter if I spiced it up--or took the spices down a level--chili was just not her thing. Then we created this chili spaghetti recipe and it was a whole different story. 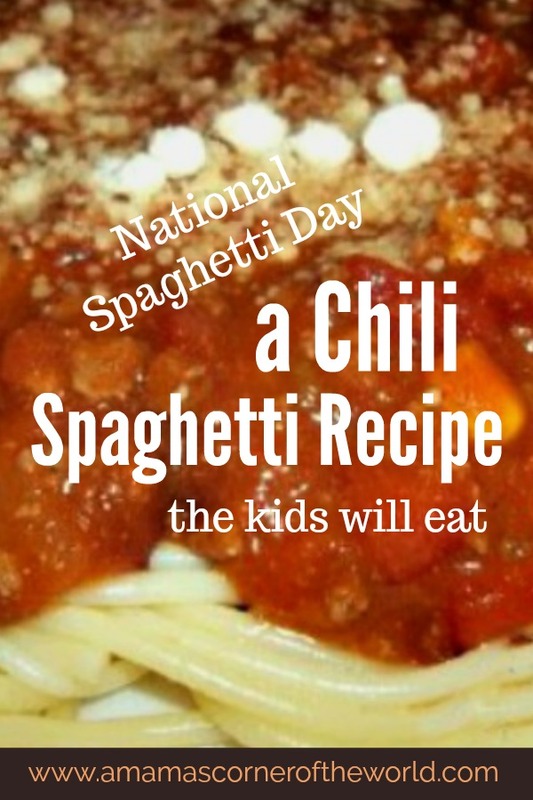 I finally found a chili spaghetti recipe that the kids will actually eat! Disclosure: Our posts contain affiliate links. If you choose to purchase a product via our links, we may receive slight compensation from your purchase at no cost to you.